An American who wishes to get married in France should contact the French Mairie (City Hall) months ahead of the wedding. Various documents will be required, including a Certificat de Coutume (Affidavit of Law) and a Certificat de Célibat, also called Certificat de Capacité Matrimoniale. These will prove to the French authorities that you are free to marry, and that the marriage will be recognized in the United States. There are more than 35,000 cities in France, and each has developed its own procedure and list of requirements. The United States Embassy in Paris is not authorized to issue a Certificat de Coutume, though it provides an optional form on its website. Many Mairies only accept Certificats de Coutume delivered by attorneys licensed in the United States. We will provide you with the appropriate documents. Please note that we deliver these certificates directly in French, which avoids the delay and expense of a translation. Likewise, a Pacs (pacte civil de solidarité, a form of civil union) between a French-American couple requires a Certificat de Coutume, which we also deliver. 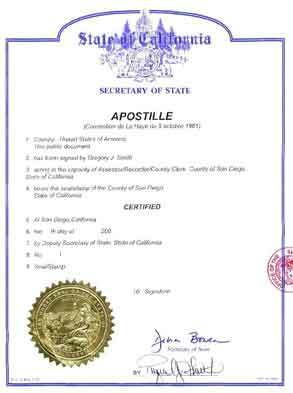 We can also obtain Apostilles (internationally recognized legalizations) on our own documents, or on various public records. Some Mairies require Apostilles on American birth certificates and other documents. We also deliver Certificats de Non-Appel (Certificates of Non-Appeal), which are necessary for the recognition by French authorities of an American divorce. These certificates are also drafted directly in French.